“My whole front lawn and backyard is dead — even my house plants are dying,” said April Peng, who lives in Vancouver, WA, just across the Columbia River from Portland. 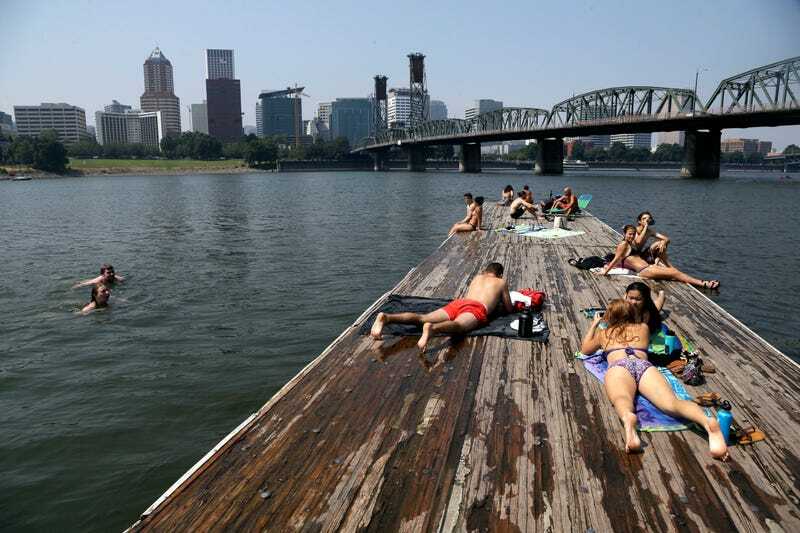 A heat wave in the northwest has sent temperatures soaring over 100 degrees — something not usually seen even at the height of summer in coastal cities like Seattle and Portland. Peng wasn’t alone in trying to get an AC — and said she had to go to or call 6 stores before finding one with AC units in stock. Many people in Portland have never needed to install AC before — and in Seattle, less than one-third have AC at their homes. Before deciding to give in and buy the AC unit, Peng said she had to make the hard choice between stale hot air in her home or opening the windows and getting “smoker lung” from the air pollution caused by the fires burning in B.C. Smoke from the wildfires was carried south into Washington and Oregon last week and a high pressure system that stalled winds that would usually sweep the smoke into Idaho and Montana has allowed the smoke to settle over Washington and parts of Oregon since. The air quality has ranged from “moderate” to “unhealthy for sensitive groups” to “unhealthy” to “very unhealthy” in Washington and Oregon because of the B.C. fires. In eastern Washington, where I am based, air quality reached “very unhealthy” levels last Saturday — prompting official warnings that even healthy people should stay inside or wear an N-95 respirator mask outside. The uncharacteristic heat and smoke-pocalpse have some wondering if this is climate change taking hold in the Pacific Northwest. According to experts — the answer is yes and no. “In general we’re seeing climate change increasing the frequency and severity of heat waves,” said Rachel Cleetus, lead economist and climate policy manager with the Climate and Energy program at the Union of Concerned Scientists - a non-profit science advocacy organization based in Cambridge, MA. Temperatures across the northwest have increased since pre-Industrial times with a regional average of 1.3 F, according to the Environmental Protection Agency. An average annual temperature increase of 3.3 F to 9.7 F is projected by 2070-2099 - depending on whether or not global carbon emissions are cut drastrically or not - with the largest increases to be in the summertime. When it comes to wildfires, there are always proximate reasons for the fires to start — such as lightning or human causes, but climate change is working in the background, Cleetus said. Even considering those factors, the fire seasons in the western U.S. are lengthening and they are seeing increased incidence of larger fires when they do happen. “Everything else equal, we’re seeing a greater contribution from climate change to worsening wildfire seasons,” Cleetus said. Large wildfires in the northwest — often thought of as green and rainy — are now becoming more common. The northwest is not alone in this. Other high-latitude forests are seeing increased incidence of fires, including Siberia and other boreal forests. When large fires occur in the boreal regions, there is the potential for dangerous feedback loops that worsen climate change, Cleetus said. One example is the smoke from these fires settling on ice — causing it to melt faster because it is now a darker color and absorbs more heat from the sun, or the burning of peatland and melting of permafrost which then releases even more greenhouse gasses into the atmosphere. “The fingerprints of climate change as a contributing factor are there and it’s the moment from a public policy perspective where we have to think very soberly about future predictions and how to prepare for that,” Cleetus said. “The reality is that in the next few decades we’ve locked in a fair amount of carbon emissions and we can expect these worsening fire seasons to continue,” Cleetus said. Luckily for residents of the Northwest, the unusually smoky conditions blanketing the region are not caused by climate change and won’t last. Donald McKenzie, a research ecologist at the U.S. Forest Service who focuses on landscape ecology of fire with an emphasis on climate change, said the stagnant air is caused by a high pressure system that is not unusual for northwest summers. It lasts for around two weeks. Unfortunately for the Pacific Northwest, that system happened to coincide with a big outbreak of wildfires, McKenzie said. While this isn’t necessarily a harbinger of future summers as climate change sets in, it is true that the more fire there is, the more smoke there is and the more likely another fire is to happen during this period of stagnant air, McKenzie said. The Forest Service has been doing a lot in terms of working with individual national forests to figure out how to adapt to climate change, McKenzie said. In addition to adapting to fire, they are looking at what’s happening to animal habitat, streamflow and glaciers. McKenzie and his colleagues have been traveling to all the forests holding informational sessions about what’s going to happen and how that affects resources. “The main thing is to engage people working on the land every day, to engage them and get their best ideas about what they expect — they will know their landscape better than any researcher,” McKenzie said. One example of forest management to lower the risk of large wildfires is prescribed burning, or controlled burns. This reduces the amount of tinder available to fuel the fires, and is a healthy and natural process. Unfortunately, sometimes this involves a tradeoff as nearby residents can be affected by the smoke from these controlled burns. “The idea of tradeoffs is the most important concept for people to understand — it’s easy to criticize what the Forest Service and other agencies are doing if they don’t understand the tradeoffs,” McKenzie said. While climate change is likely to cause more fires in the future in the northwest, and more fires mean more smoke, the good news is that overall climate scientists think the Northwest may be less impacted by climate change than other places in the U.S.